Roedersville Church was organized in June 1956 as an outreach of Indiantown Mennonite Church. Four Mennonite families moved into the area from Lancaster County, some of which were members of Indiantown Church. The Indiantown minister visited each family to get their feelings about starting a church in the area. They all agreed to participate in helping to plant this church, by using an unused one room school house built in 1900. Bible School was planned for later in the month. The community was canvassed by which we learned there were lots of children who were interested in coming to Bible School. Indiantown Church helped out with teachers. Some nights attendance was over 100. There was no other Bible School in the Pine Grove area at that time. Bible School was held Monday, Wednesday and Friday evenings for three weeks. After our first Bible School, Sunday Morning worship was started with Indiantown ministers in charge and two deacons providing additional leadership. Later, three more families moved into the area. 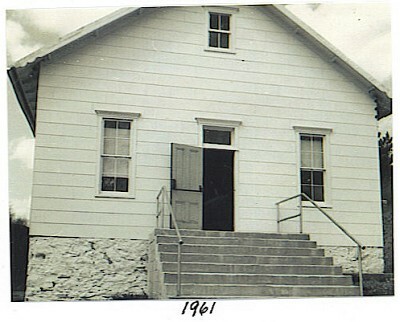 In 1973 the church was remodeled with a new entrance on the front and the addition of bathrooms and a nursery. In April 1997 construction began on the church with a three floor addition. It was decided to put an addition to the church to make more Sunday School rooms and make some repairs on the existing building. Such repairs included: new roof, new chimney, new siding, new windows, new paint, new wallpaper. Currently over twenty families attend our Sunday School and worship services.